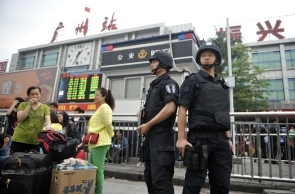 Four knife-wielding persons on Tuesday went on the rampage at a busy railway station in China's Guangzhou city injuring six people, including two women and a foreigner, in the third such attack in over two months with authorities blaming the first two on militants from Xinjiang. Four persons wearing white caps suddenly pulled out knives around 11.30 am (local time) in the square of the station and started to virtually slaughter people by slashing indiscriminately at whoever came in their way. At least two women and three men, including a westerner, were among the six injured in the attack, witnesses at the Guangzhou Railway Station told the Hong Kong-based South China Morning Post. Their injuries are not life-threatening. There were a total of four attackers, all wearing white hats and shirts and wielding long knives, a witness was quoted as saying by the daily. One of the attackers was killed, one was arrested and two escaped, with one of them captured later, reports said. Policemen shot and injured one assailant shortly after the attack occurred near the busy train station in the southern metropolis of 14 million people, Guangzhou police bureau said in a statement. Witnesses said the wounded suspect was a short man wearing a little white hat, white shirt and jeans. Reacting to the incident, Chinese feign ministry spokesperson Hua Chunying told a media briefing, "Whoever carried out this for whatever reason, the Chinese government will deal with this with firmest action to safeguard social stability and life and property of Chinese people." Two victims were injured on the back, one was hit on the arm and another one had a large amount of blood flowing from a cut on the neck, a witness was quoted by the state-run Xinhua news agency as saying. Another witness from JiangxiProvince said he saw a policeman fire at a suspect who was wielding a long knife. The suspect was in his 30s to 40s, he said. The suspect was being treated at a local hospital and his identity is yet to be confirmed. The attack did not affect railway operations, according to Guangzhou Railway (Group) Corporation. The incident is the latest attack at a crowded train station in the country within the past 70 days with two of hem being blamed on militants from Xinjiang where the majority native Uygur population is restive over the increasing settlements of Han Chinese from other provinces. China has blamed the Al Qaeda backed East Turkistan Islamic Movement for such attacks which has become a regular feature in recent months. Three people died and 79 others were injured in a terrorist attack at a railway station in Urumqi, capital Xinjiang on April 30. On March 1, knife-wielding assailants killed 29 civilians and injured another 143 at a railway station in the southwestern Chinese city of Kunming. Tuesday’s attack was the second after the recent visit to Xinjiang by Chinese President Xi Jinping during which he asked people to chase the militants like rats and vowed to deliver a crushing blow to militancy. While China has deployed armed police patrols in all cities to avert such attacks, the recurring knife assaults at crowded railway stations outside Xinjiang are causing panic among public.